SmackDown Live reportedly has a new home. Fox’s deal to broadcast Ultimate Fighting Championship (UFC) matches began in 2012. That partnership was thrown into flux earlier this month when the organization signed a five-year, $750 million streaming rights deal with ESPN to air 15 card fights on its new ESPN+ subscription streaming service. If one report is accurate, Fox will be replacing the UFC package with another made-for-TV entertainment combat sport: WWE. ESPN is reporting that Fox and World Wrestling Entertainment (WWE) have agreed to a “massive” offer to acquire broadcast rights to SmackDown Live, one of two live weekly WWE series which airs on the NBCUniversal-owned cable network USA. The deal would reportedly begin in October 2019. 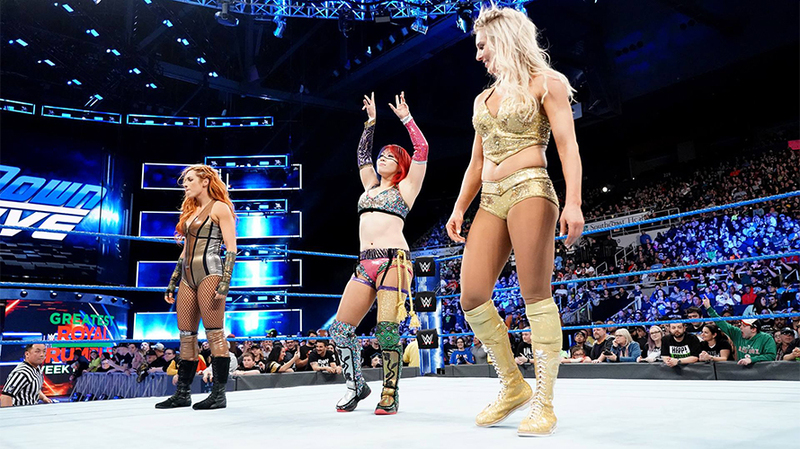 WWE and NBCUniversal have long been partners, but NBCU recently declined its right of first refusal to hit the numbers that WWE proposed on SmackDown, which airs Tuesdays on USA in prime time. NBCU instead seems to be focusing its efforts on WWE Monday Night Raw, which premiered in January 1993 on USA, and for years has been USA’s No. 1 program among adults 18-49. It is also traditionally been cable TV’s No. 1 entertainment show in the aforementioned demo on Mondays. SmackDown Live has been averaging 2.6 million total viewers on Tuesdays this year, while WWE Monday Night Raw has been posting around 3 million. SmackDown aired on the NBC Universal cable network Syfy from October 2010 to 2015. It was named Thursday Night Smackdown during that time, before joining WWE Monday Night Raw on USA Network in January 2016, and went on to change its name to WWE SmackDown Live. The “new Fox” will focus its efforts on live sports and news programming as soon as its the $52.4 billion sale to The Walt Disney Company finally closes, and the “live” nature of SmackDown Live, which combines entertainment with sports, appears to fit in that criteria. Fox Sports is not commenting at this time, nor is WWE.